The Stronghold series has been around now on PCs for over 15 years, with the RTS garnering millions of sales over its lifetime. Honestly, it's surprising there aren't more games out there that are similar. While the series started out set in medieval England, the Crusader branch took things to the deserts of the Middle East. Now that series is getting a new game on a brand new 3D engine and being self published by Firefly Studios. 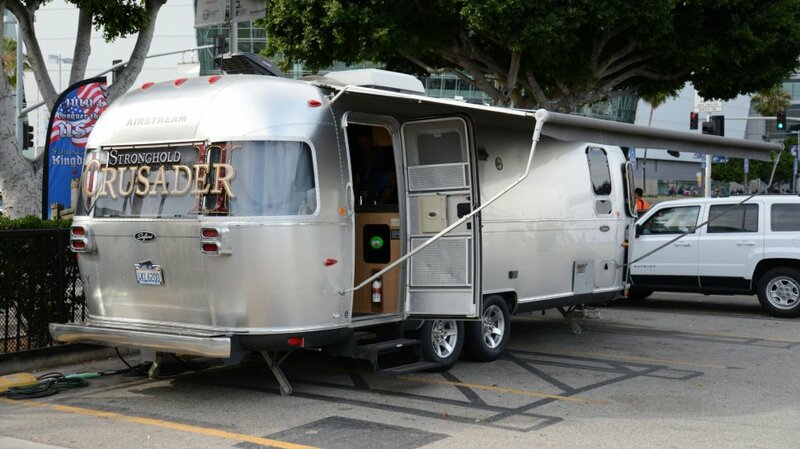 In an AirStream trailer across from the LA convention center we went eyes on with the new game. 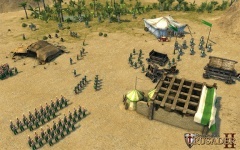 Stronghold Crusader 2 is still early in development but it's already shaping up to have many of the core gameplay elements that made the original so popular. 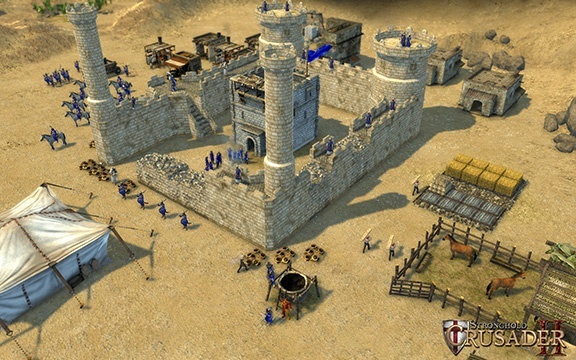 While the game will have a campaign, which will serve as both a tutorial and a series of challenges, the meat and potatoes of Stronghold is the game's skirmish mode. It's here that Firefly has put a lot of attention and added the ability to co-op with a friend. 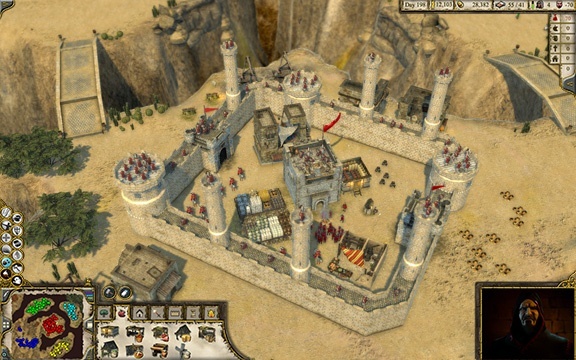 You could always play comp-stomp style co-op in Stronghold with players teaming up, taking control of their own castles, and conquering the computer. What has changed in Crusader 2 is the ability to team up and work on the SAME castle. What this means is there can be a division of labor, so to speak. 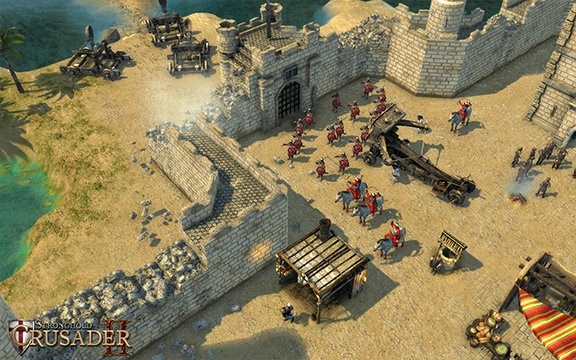 One person can concentrate on the base building aspect - setting up the economy, or making sure the army is properly equipped - while the other might concentrate on defenses, the castle, and ordering troops around. Any player in the two player co-op mode can control and do whatever they want. While watching the developers demo this mode of play, it was easy to see how this was a natural fit. They were perched atop a mountain and soon found two AI armies charging up opposite sides. They split their troops and started planting firepots in the ground on opposite sides. It was easy to see what the other player was doing as every action was reinforced by a few yellow circles surrounding it, indicating the other player had initiated these. Soon the armies were upon them and each took control of troops to fire arrows into the pots, setting the attacking armies ablaze. 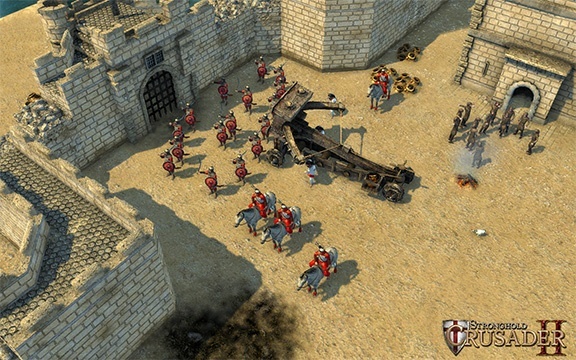 Stronghold Crusader 2 is set for a 2014 release but Firefly is making sure they get the game right so there's no hard release date yet. While the co-op mode looks like a natural fit, Senior Producer Paul Harris told us "[the co-op] wasn't planned, but during development it just sort of made sense to add it." While the player count is currently set at two, that may change, and the team plans on testing more configurations to see how they play out. 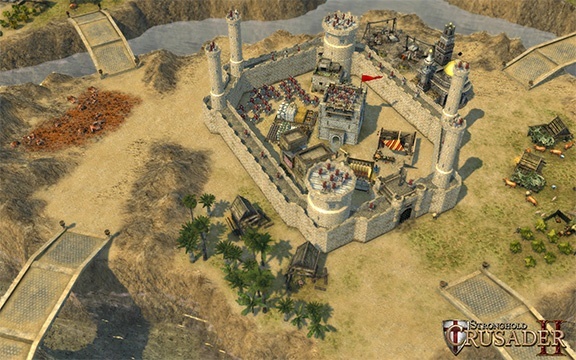 Overall, fans of the series should be pretty excited about Stronghold Crusader 2. If the RTS, which has been known for its punishing difficulty, has turned you off in the past - perhaps the co-op should make things a bit more accessible. Stronghold Crusader 2 will be available via Steam for the PC when it's released. Page created in 0.2526 seconds.